NOTE: This content is old - Published: Wednesday, Jan 31st, 2018. Plans for a new £4 million learning disability day centre in Queensferry look set to be given the go-ahead by county planners next week. The new day centre will replace the current ‘ageing and inefficient Glanrafon building which sits opposite Deeside Leisure Centre. 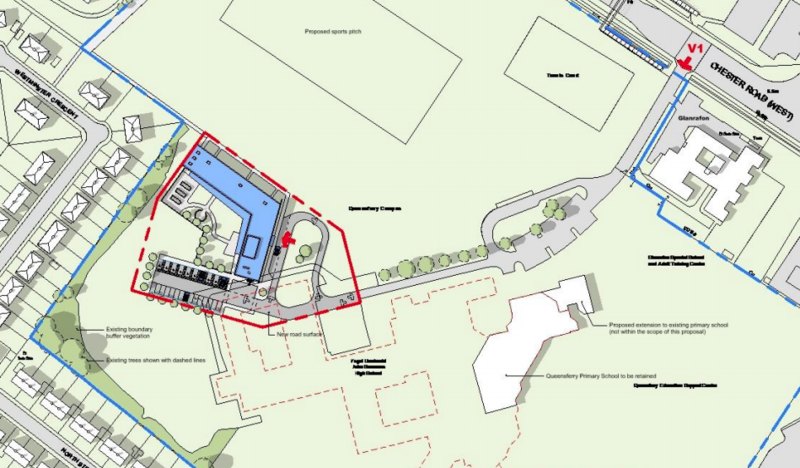 Should plans be approved the new centre will be built in the grounds of the former John Summers High School close to the rear boundaries of properties on North Street and Westminster Crescent. The school building currently occupies part of the proposed new site and will be demolished prior to building work starting. The new day centre will accommodate a single-storey new build with an enclosed ‘Sensory Garden’ to the south of the proposed building. Associated parking and a small amount of landscaping and external lighting is also proposed. ‘The proposed development is intended to meet the current requirements of the area as well as providing for future needs.’ According to planning documents. The building takes the plan form of a ‘V’ and creates two wings, within which the accommodation and facilities are located. The external appearance of the building utilises high-quality contemporary detailing and materials in its composition. I am satisfied that this proposal represents a bold, modern but sympathetic design response to both the operational needs of the building and its setting. “Despite the council facing an enormous financial challenge, we have set out a clear and ambitious capital programme and this £4 million demonstrates this Council’s commitment to providing much-needed investment in this important and valued service. The planning committee will meet on February 7 to discuss the proposals.